It's been a while since I took a long vacation (about a year in fact, not including the winter holidays which are more about visiting family than new experiences abroad). This year we decided to go to Japan, because James has never been and we thought it would be a pretty easy trip. Some things are different, though. A pleasant surprise (which I didn't observe in non-Tokyo locales in 2010) is the reduction in public smoking. We haven't been to a restaurant that allowed smoking yet, and even at the Hachiko exit at Shibuya Station they have an enclosed area for smoking now. There doesn't seem to be so much smoking on the streets, either. It's really a great improvement and I'm super happy since this was the one downside of visiting Japan I'd been dreading. I knew the trip was off to a great start when we boarded the plane and were treated to the new Delta instruction video, featuring tribbles (yes, tribbles)! Very entertaining. We took a direct flight to Haneda which is really convenient - we're staying in Shinagawa which is only about 10 minutes from the airport. Jet lag is really tough, meaning we had a very early start. The hotel we're in provides breakfast so we had that at 7 am, then killed time in Shibuya for a while. We visited the Starbucks overlooking the famous Hachiko crossing, across the street from where I used to work. My old school is now an Aeon English conversation school, so in a sense it's still there! After strolling around the area for a bit we headed to Kichijoji, where we walked through Inokashira park and James was introduced to the sound (it seems nearly deafening, it's so loud) of cicadas in summer. You have to go through the park to get to the Ghibli Museum, which houses exhibits (and due to its design is an exhibit all in itself) on the anime of Miyazaki and Studio Ghibli. Movies like Spirited Away, Princess Mononoke, and Nausicaa are examples of these films. The building is amazing, with kid-sized nooks and crannies to explore, beautiful stained glass windows, and a life-size Laputian robot on the roof. Unfortunately they don't allow photos, but I highly recommend a visit if you are traveling to Japan! The best exhibits were the spinning 'analog' animation machines and user-operated film playback displays. We also really enjoyed the short animation they showed in the theater. 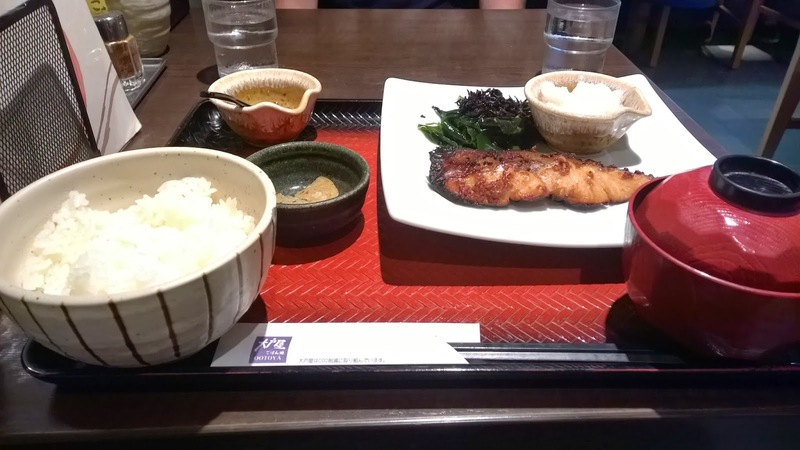 After a walk back to Kichijoji we had lunch at one of my favorite chains, Ootoya. The food is still yummy! Without wifi or cell data it's pretty hard to find your way around; I'd wanted to eat at Ume no Hana but we couldn't find it. Will have to try again somewhere else this trip. We also took a quick trip to Shinjuku to take a look at the city from the Tokyo Metropolitan Government Building (free!) and get a copy of Metropolis from the Tourist Information Office there. After that we walked to Tokyo Opera City which has a great (also free!) exhibit on art and technology (NTT Intercommunication Center). Highly recommend this! My favorites were the spinning animation machine and the laser art. Even though we were taking the trains between areas of the city, we still ended up walking about 9 miles!